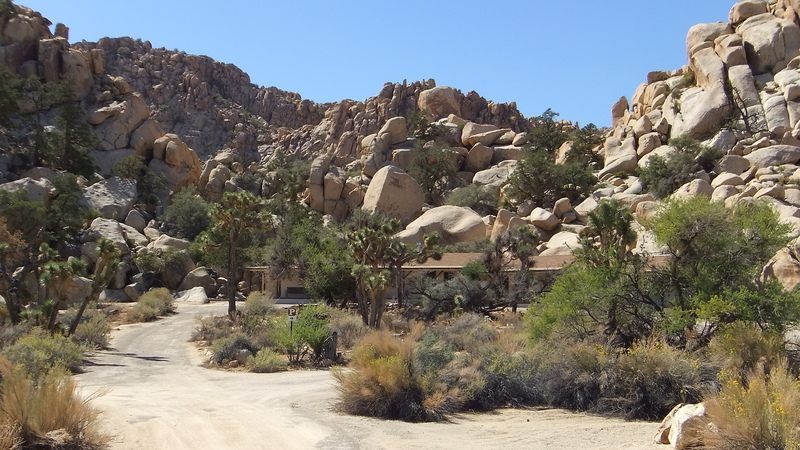 THE LOST HORSE RANGER STATION SETTING could not be lovelier, nor more rugged looking, set as it is against rocky hills, deep canyons and spectacular large rock pile ‘inselbergs.’ The views north and east from this area stretch out for miles. 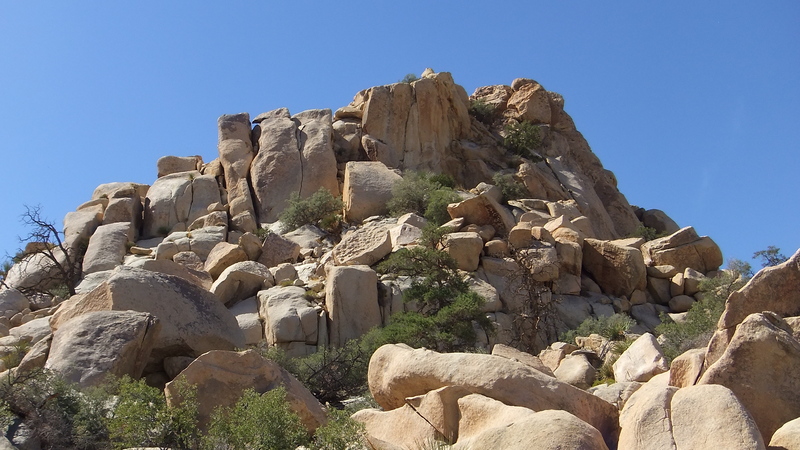 Rock climbers four or more decades ago discovered several ideal formations to challenge their climbing skills. 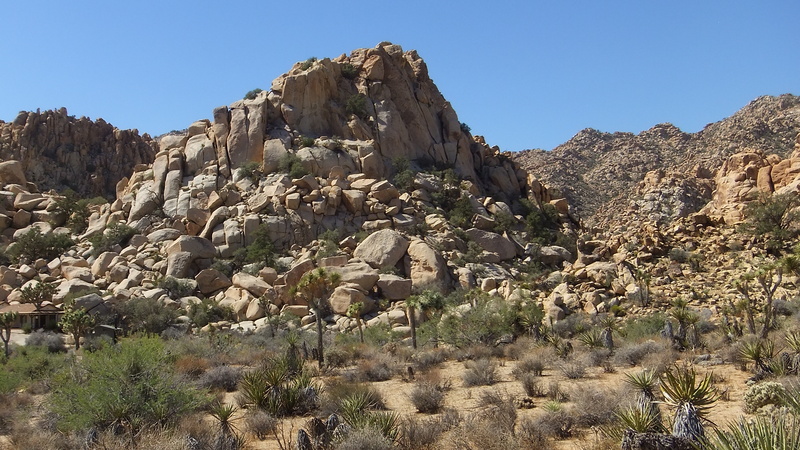 The prominent ones in and around the ranger facility are known as Ranger Station Wall, Hill Street Blues with its pale slate gray tint, and the S Crack Formation—the latter named for its vertical, S-shaped gash in the gingerbread to dark walnut varnish face. 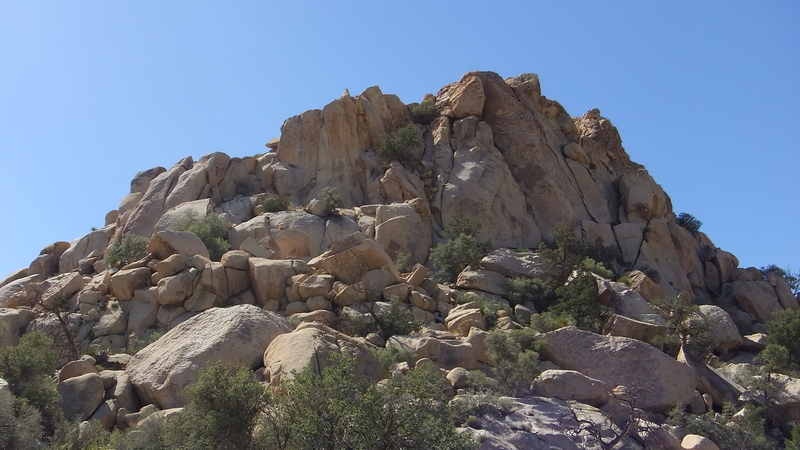 The short quarter-mile stroll from Super Heroes Wall along Lost Horse Ranger Station Road takes only a few minutes. 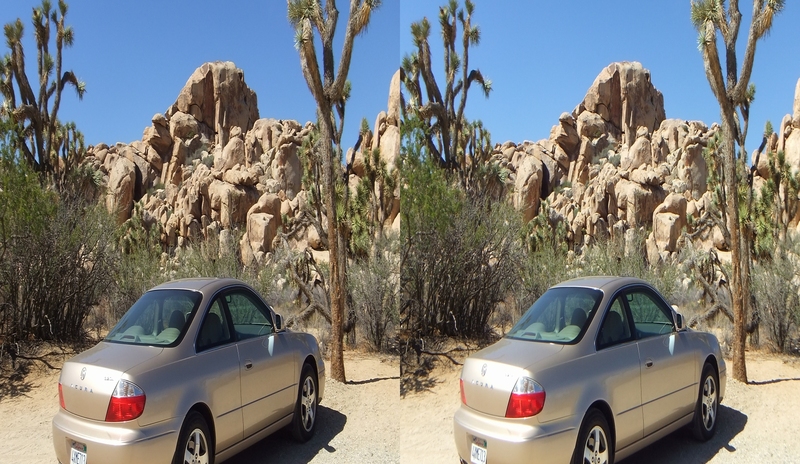 Park at the last turnout beyond where the Lost Horse Ranger Station Road is closed to public vehicles. 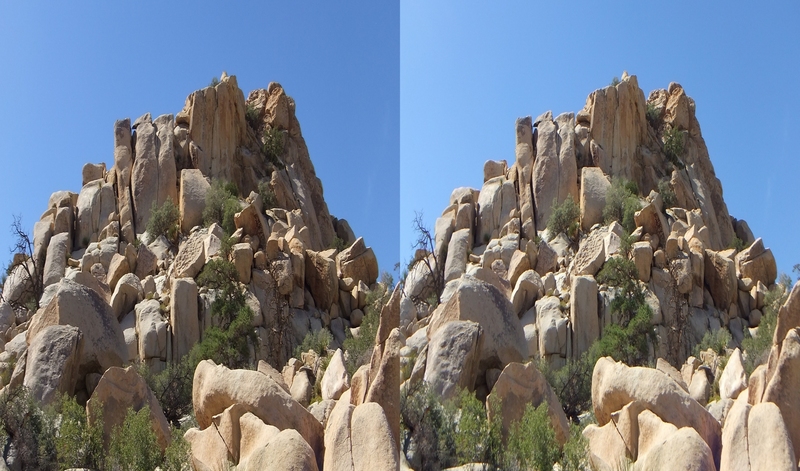 There are two small granite groups here, Super Creeps Wall and Super Heroes Wall. 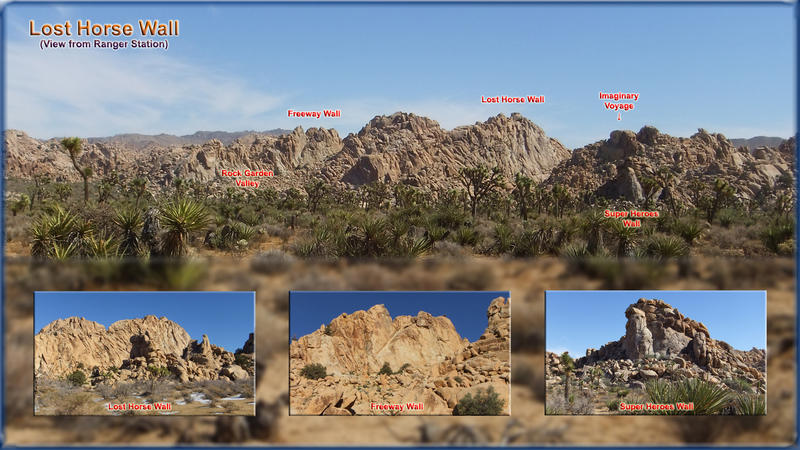 On this trip, I needed photographs of the western side of Super Heroes Wall to complete the earlier set; further, I wanted to approach the hillside from the right (cross-country) instead of along the less interesting dirt road, walking from the parking area through the brushy landscape. 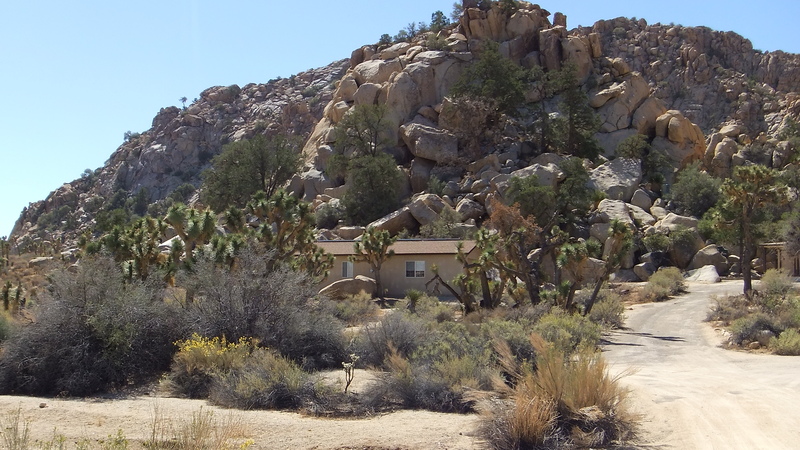 If you follow in my footsteps, tread lightly when nearing the ranger station since the crews have restorative plantings on the slope immediately above the buildings. 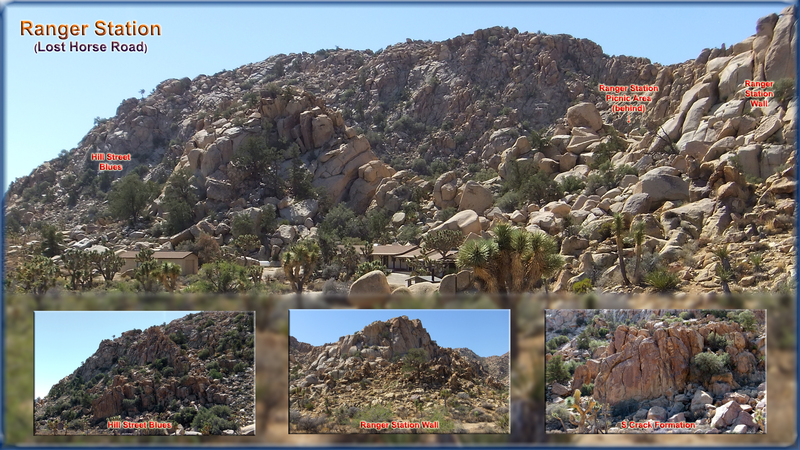 I skirted well to the north in a long arc that brought me directly to the canyon where Ranger Station Wall towers in a pyramidal formation. 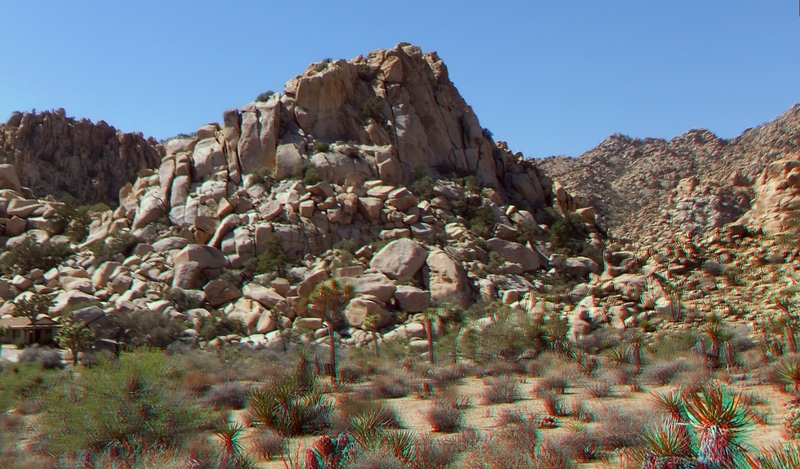 The whole way, Joshua’s familiar rocky hills behind and ahead provided endless vistas (and 3D photograph opportunities). 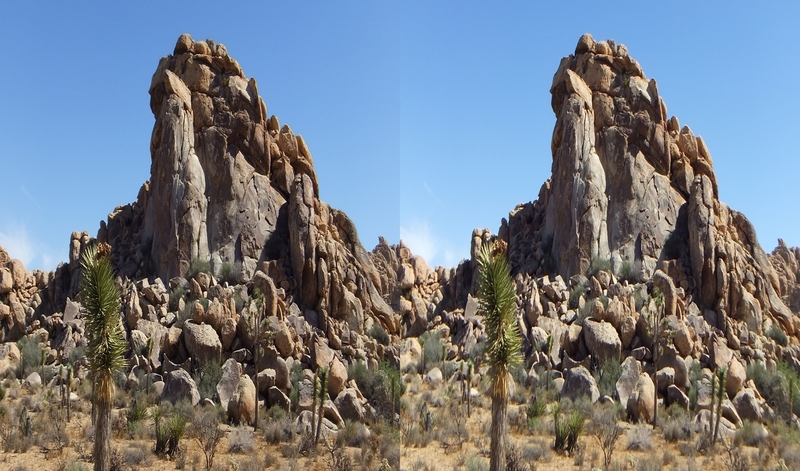 Behind, as you hike up the slope toward Lost Horse Ranger Station and Ranger Station Wall, the view expands and the large Lost Horse Wall formations rise into a grand granitic series of peaks, cliffs, and deep valleys. 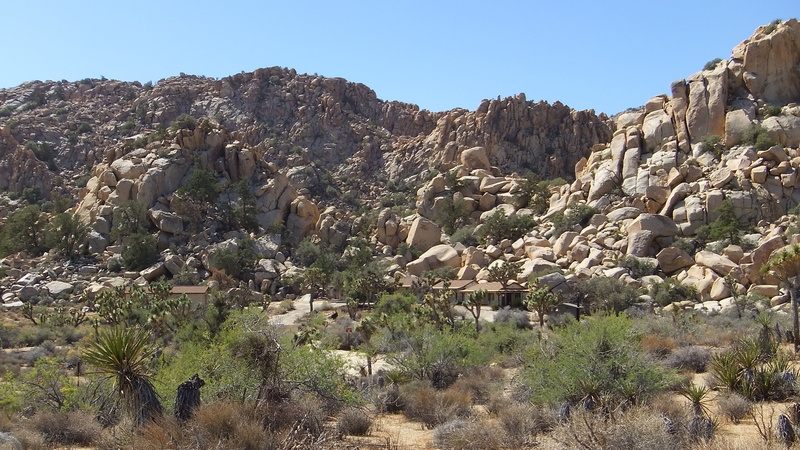 The Ranger Station is tucked between two large inselbergs where upwards of 20 climbing routes have been staked out on Ranger Station Wall, at right. 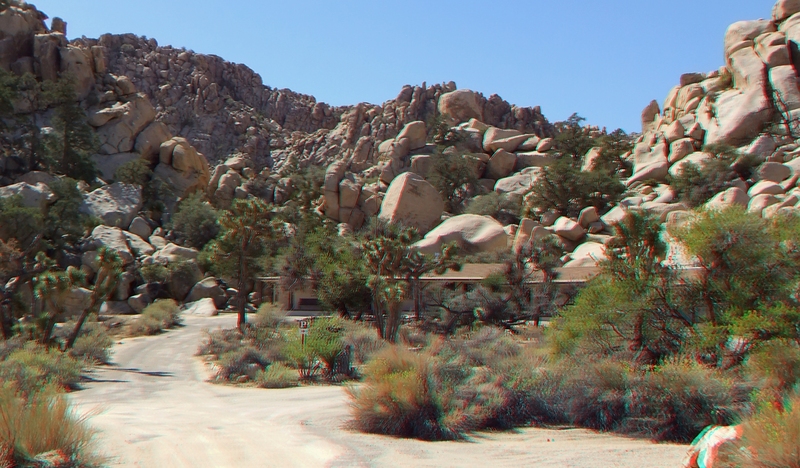 There is a public restroom facility here. 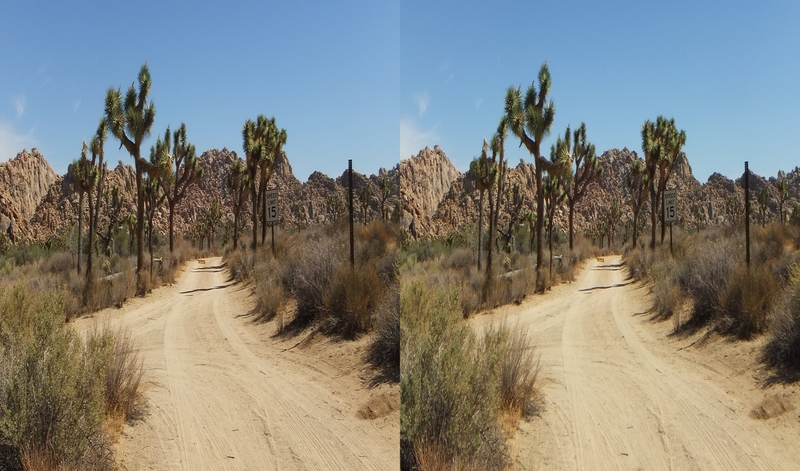 Lost Horse Road at this point splits, with both accesses gated. 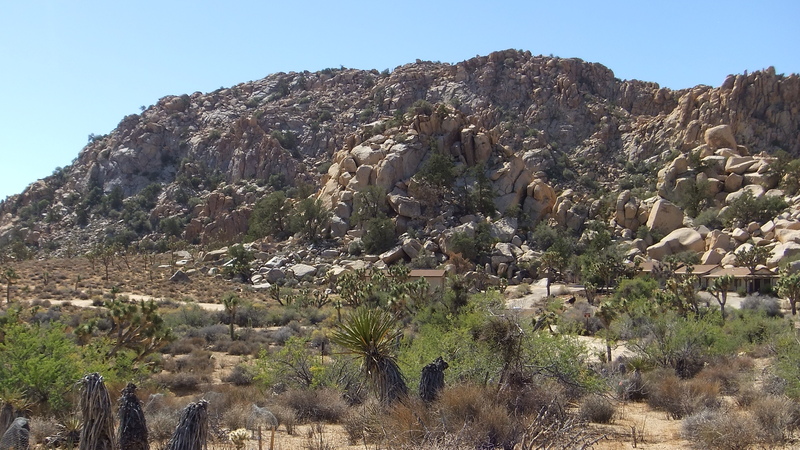 The left branch takes you across the desert floor to Jimmy Cliff (the large blob rising out of the plain half a mile away) and some smaller formations associated with it including Mt. 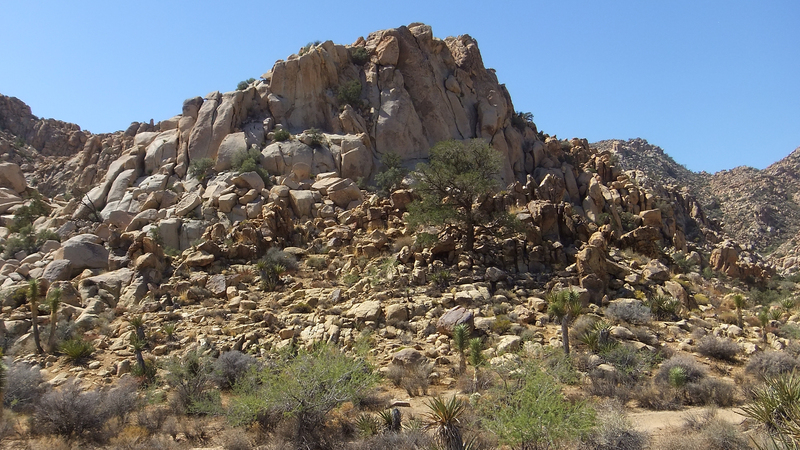 Grossvogel and Poetry Rock. 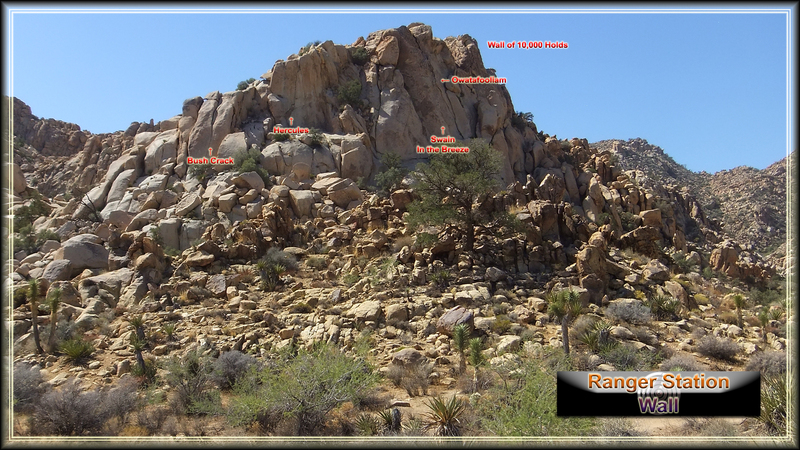 The “Wall of 10,000 Holds” is on the right side, as indicated in the illustration. 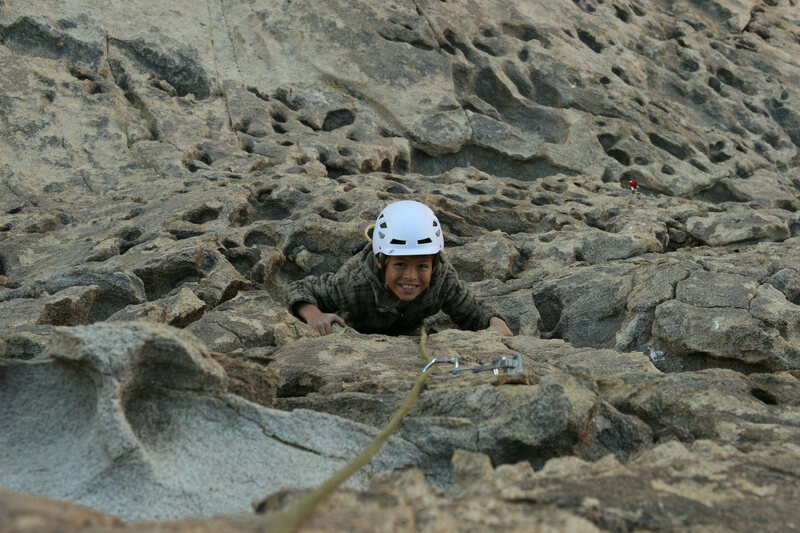 Mountain Project’s website provides a photo of a youngster climbing the “huecoed-out” wall that looks like Swiss cheese (above, right). 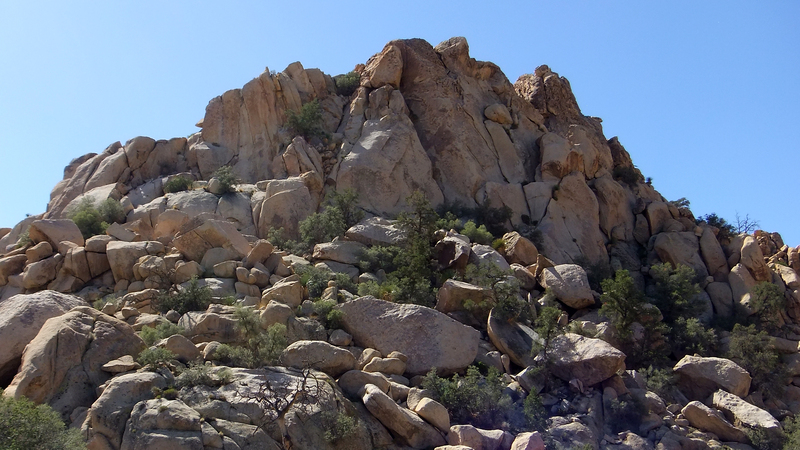 Your narrator did not climb this wall. 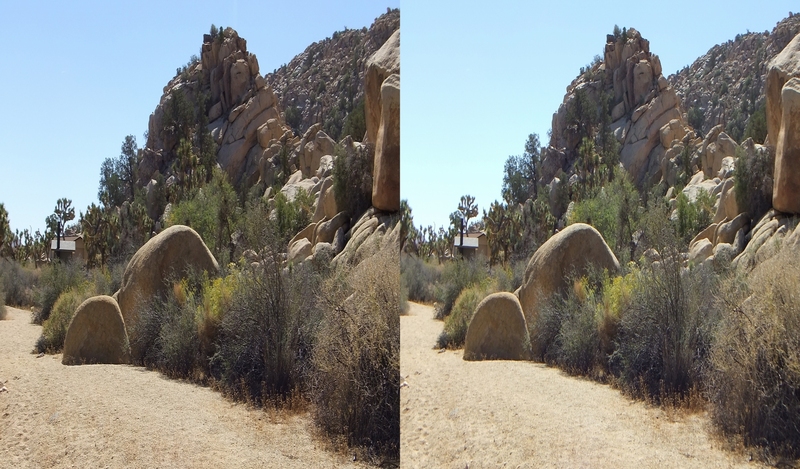 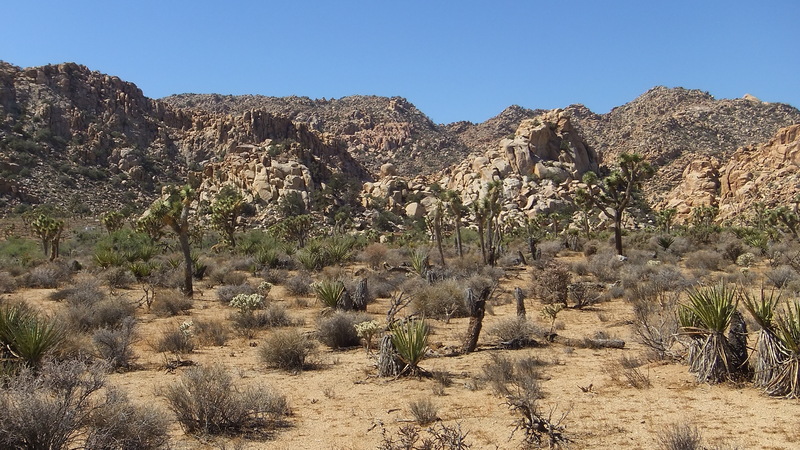 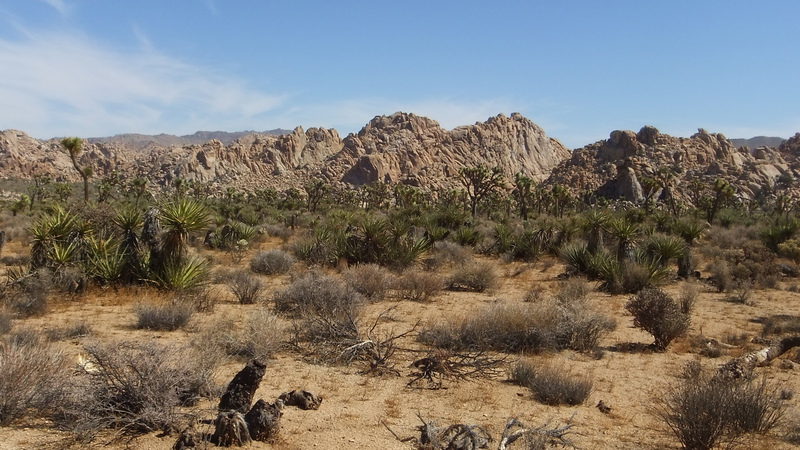 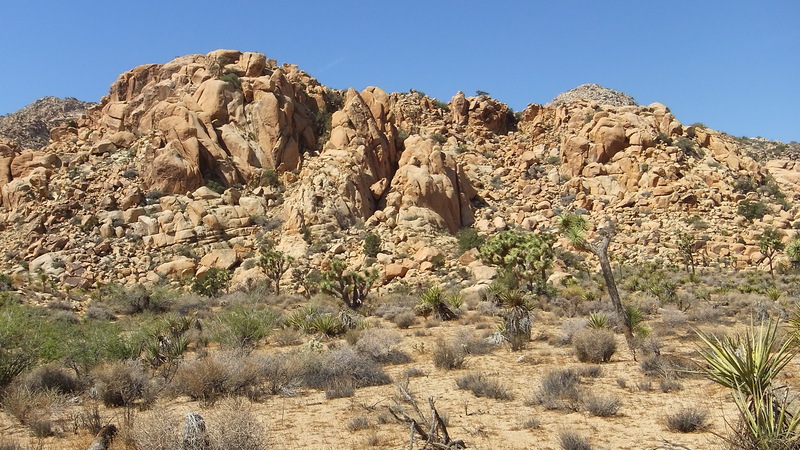 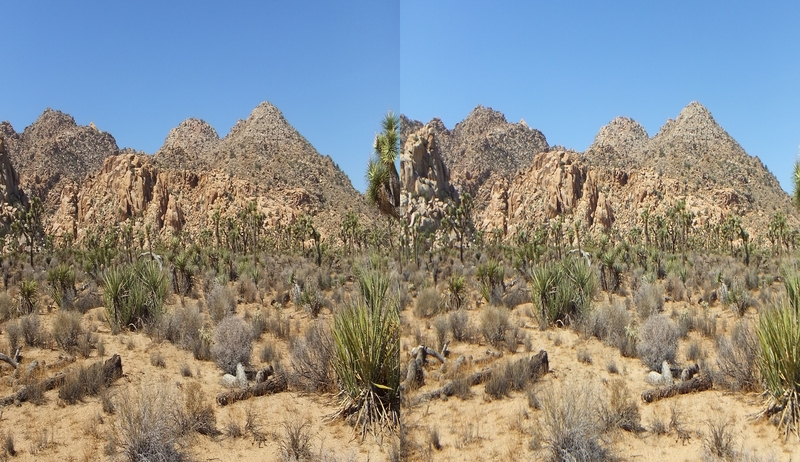 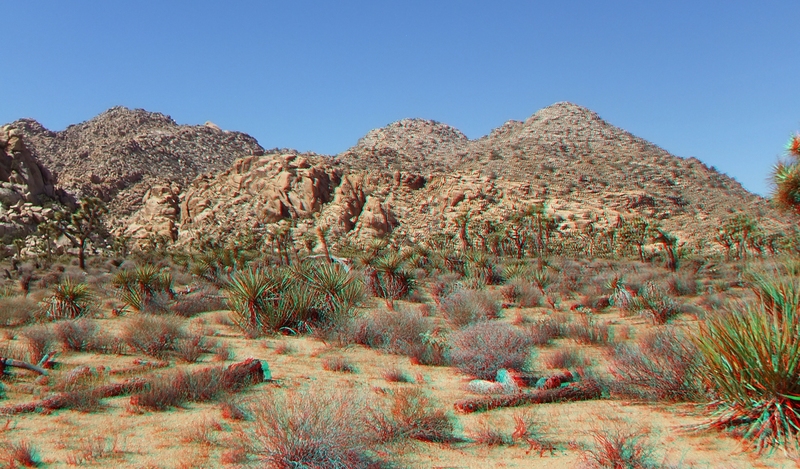 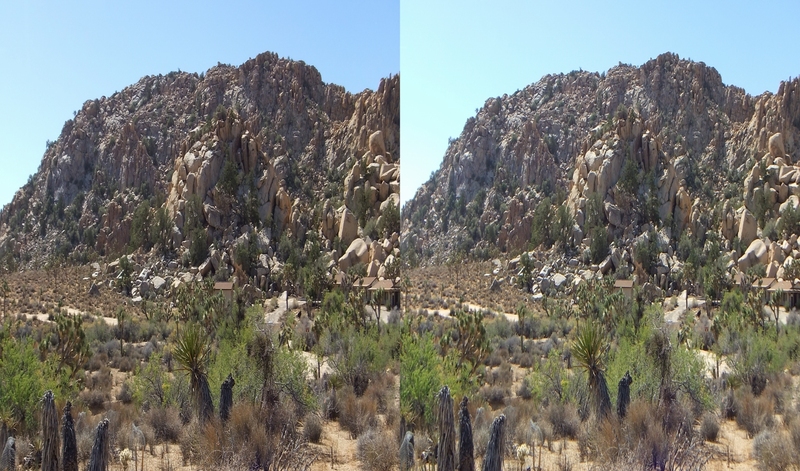 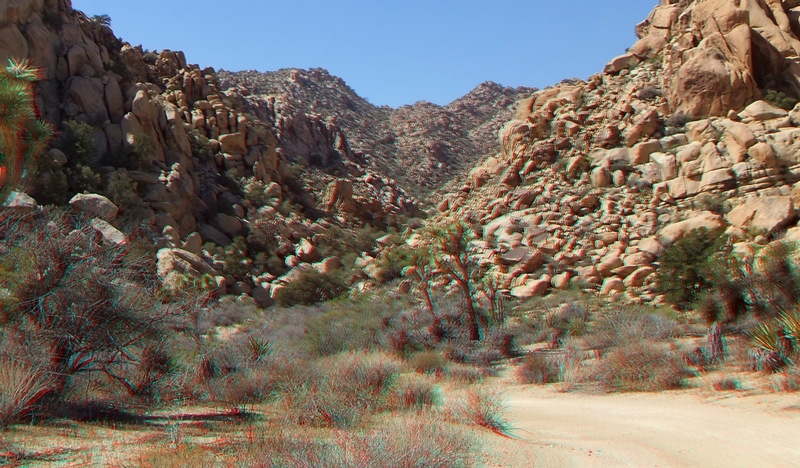 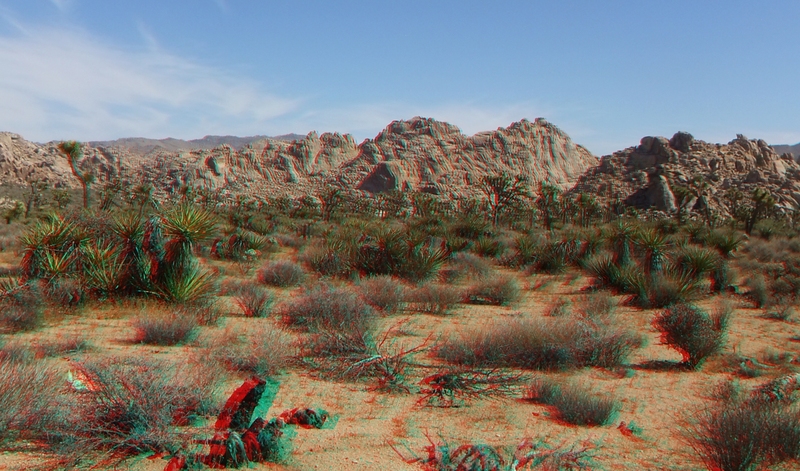 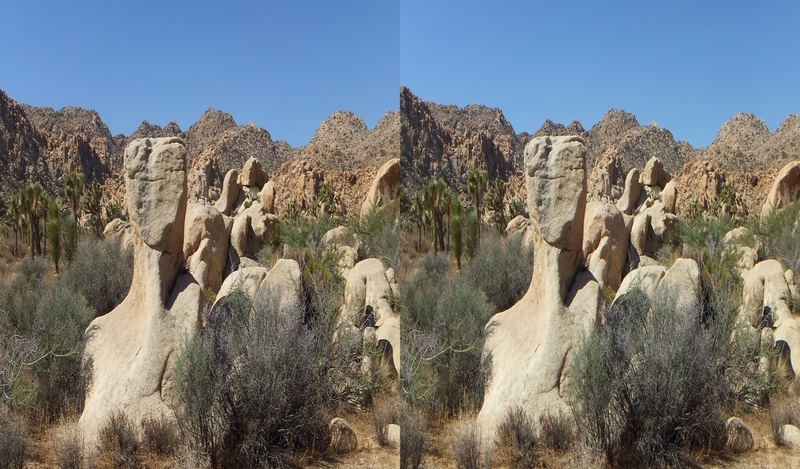 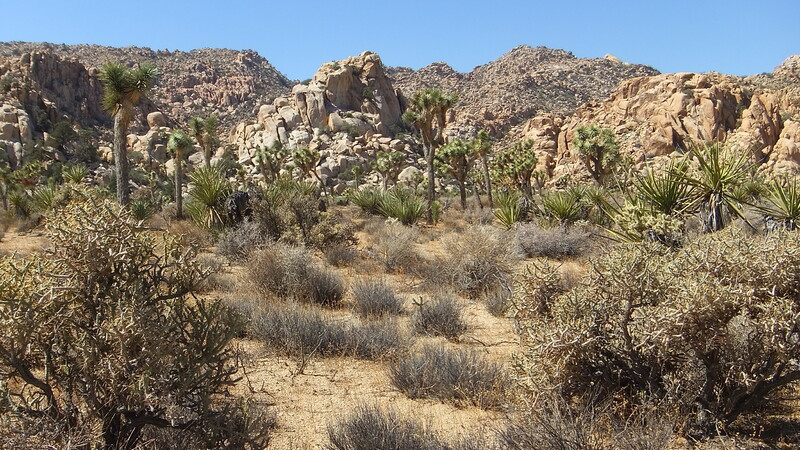 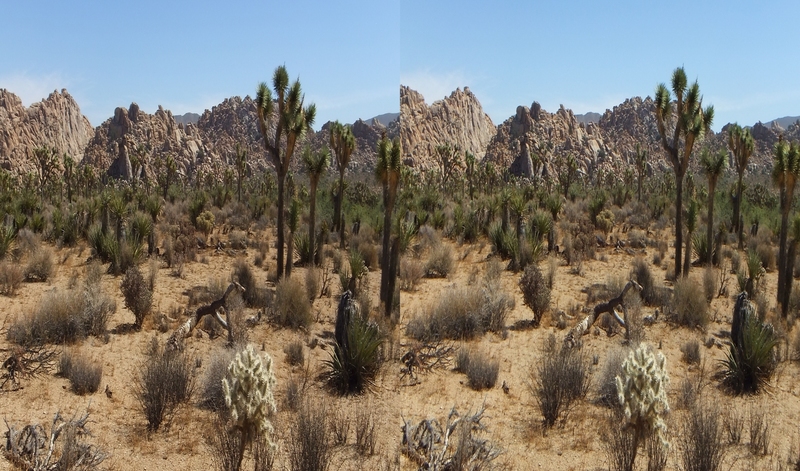 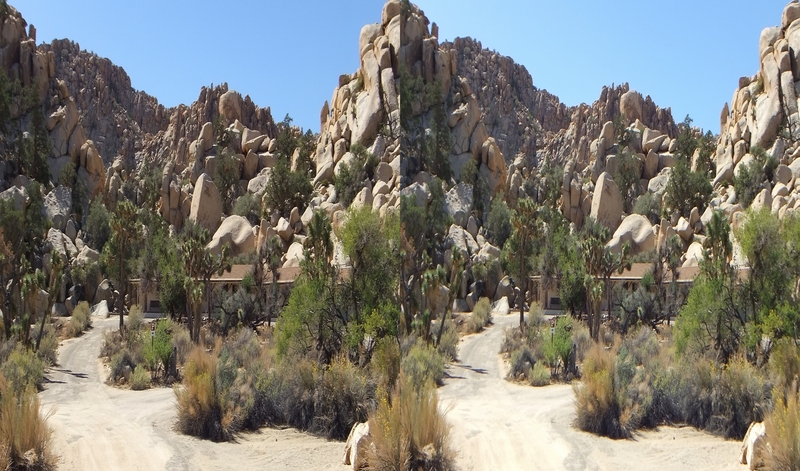 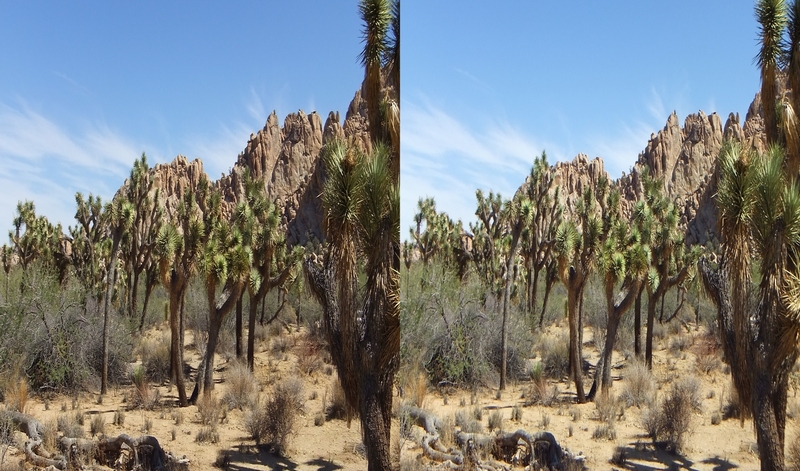 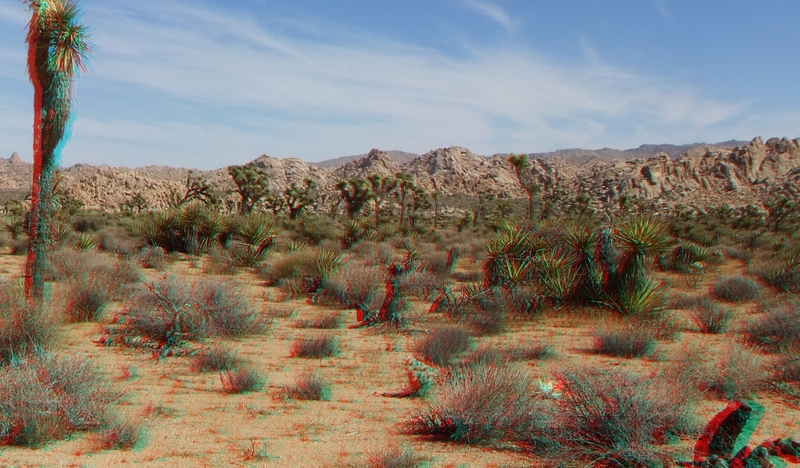 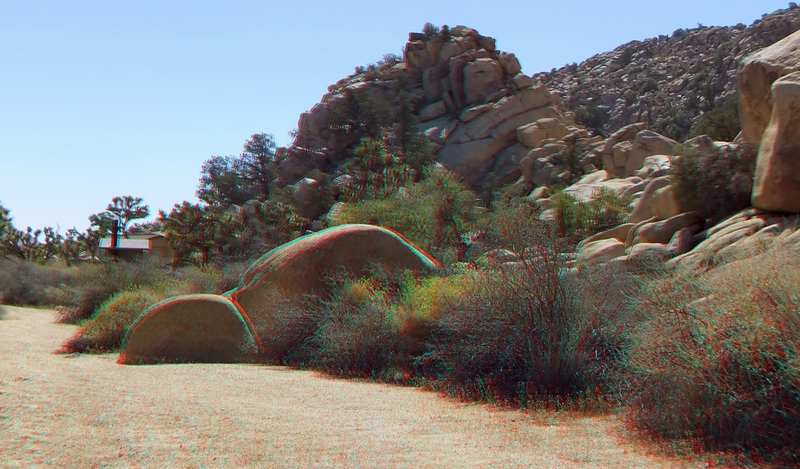 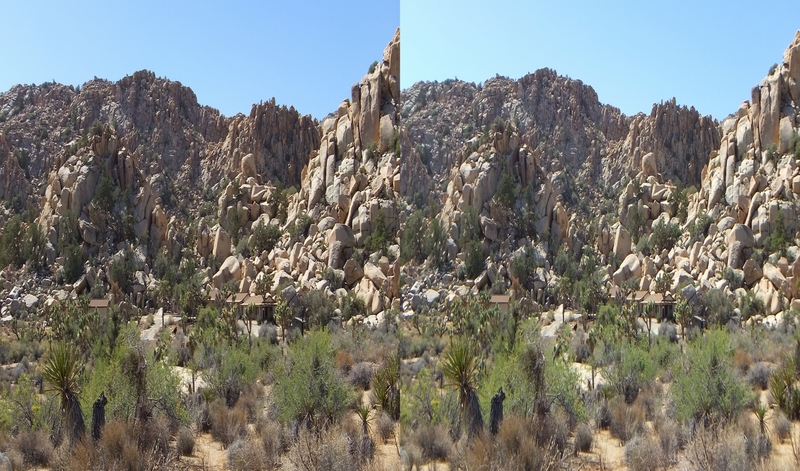 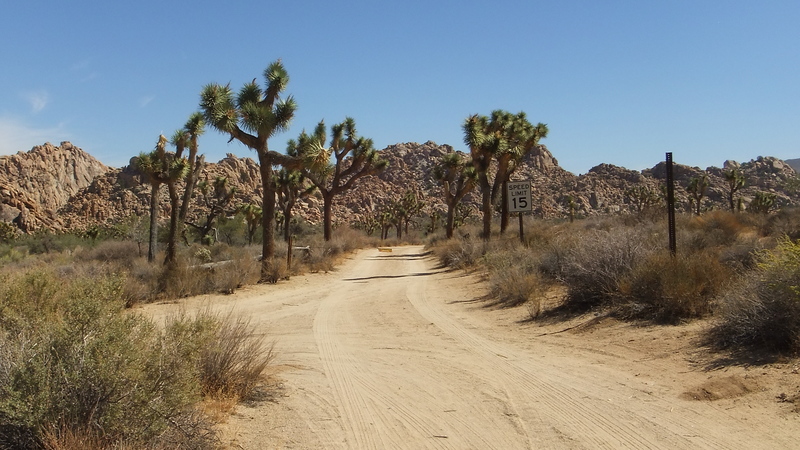 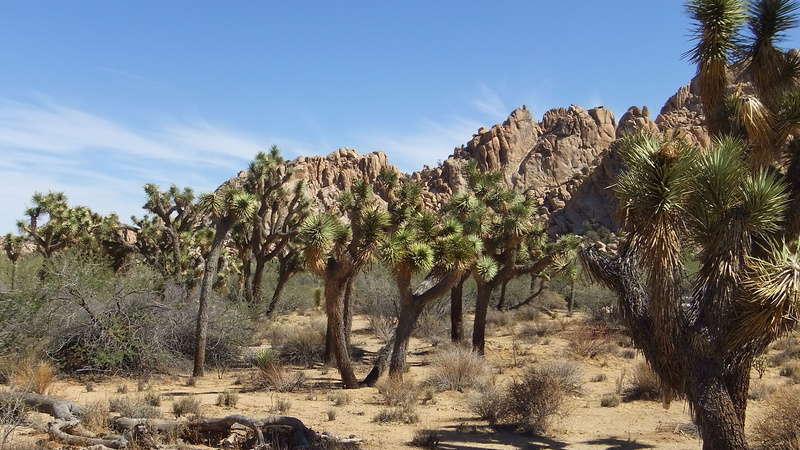 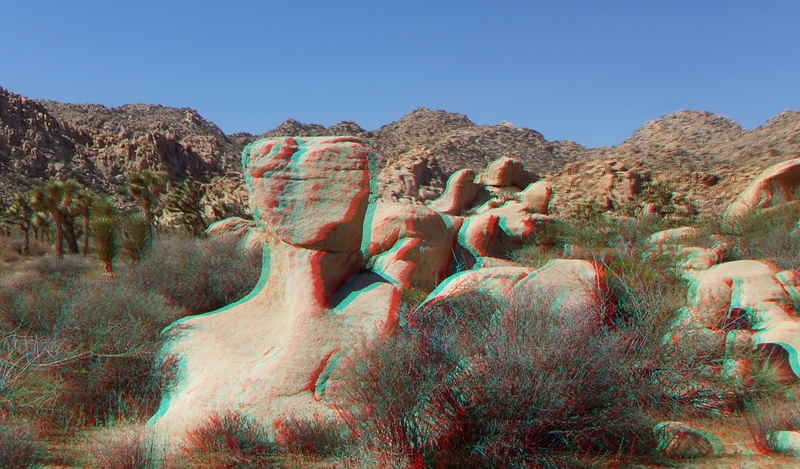 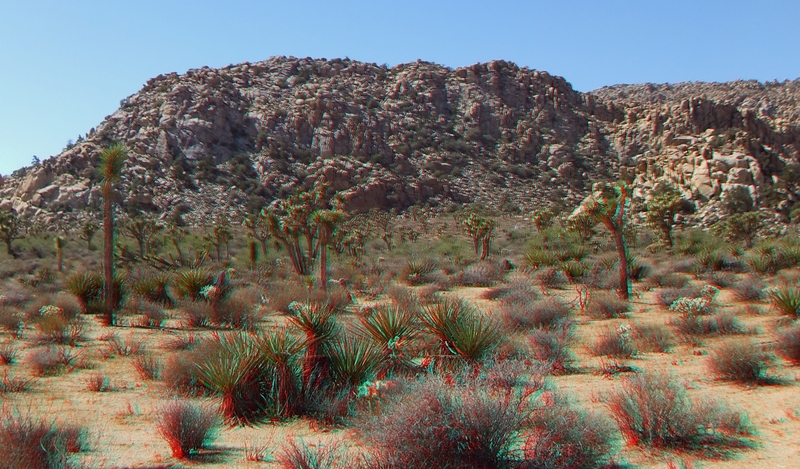 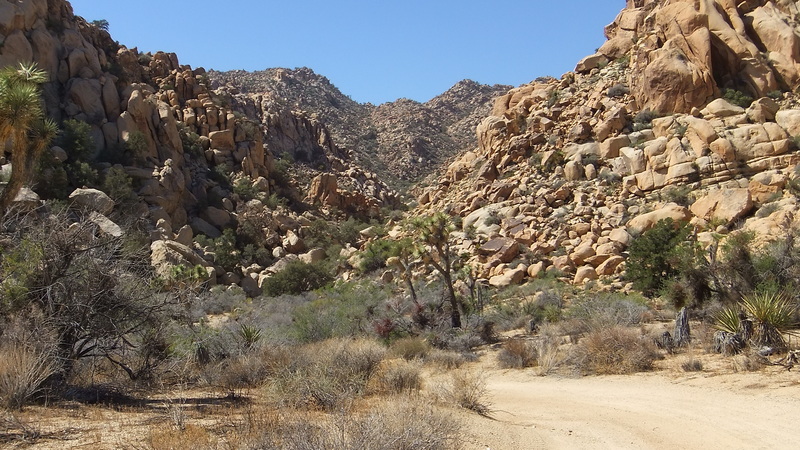 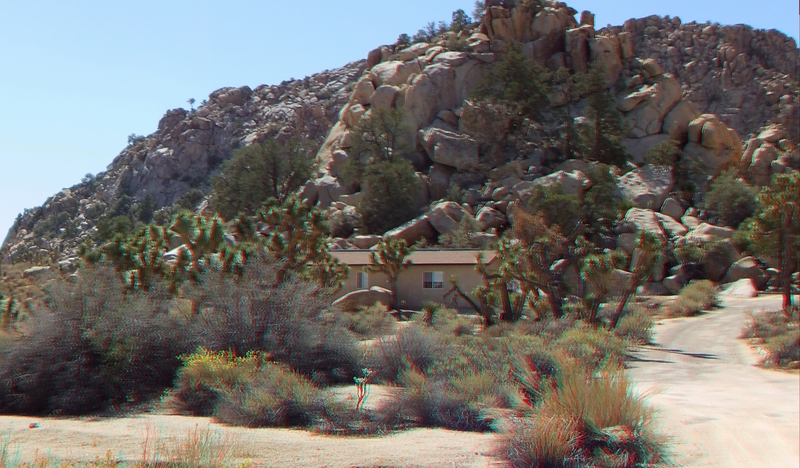 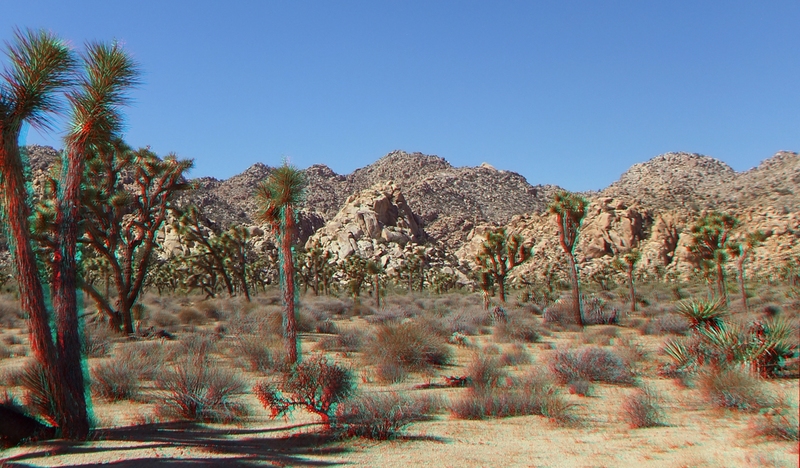 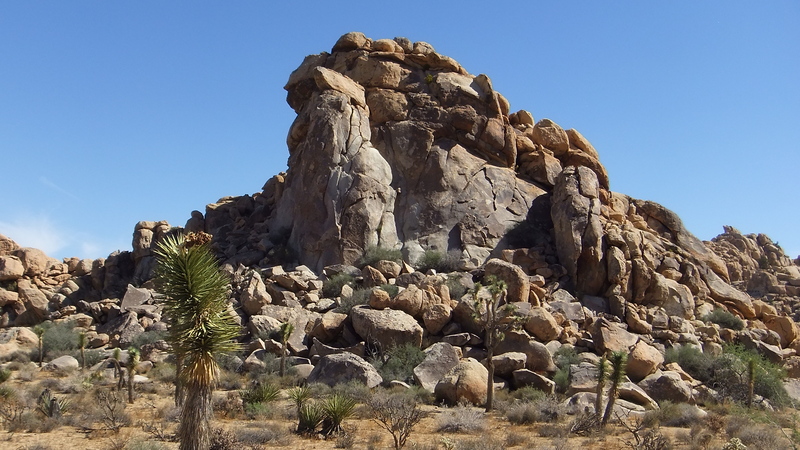 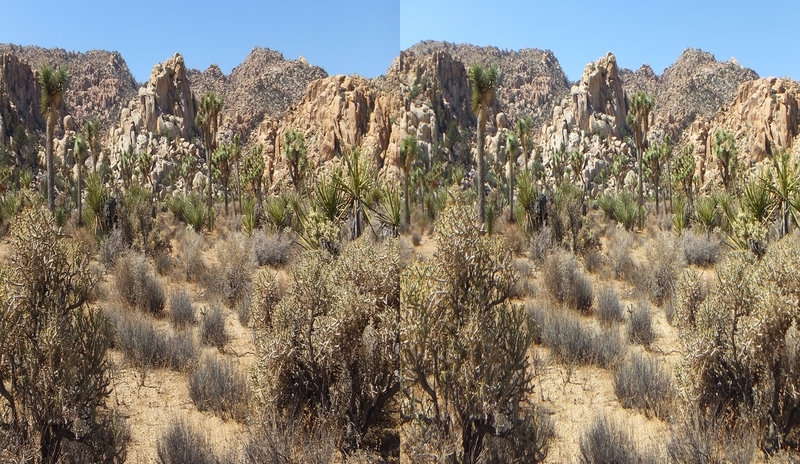 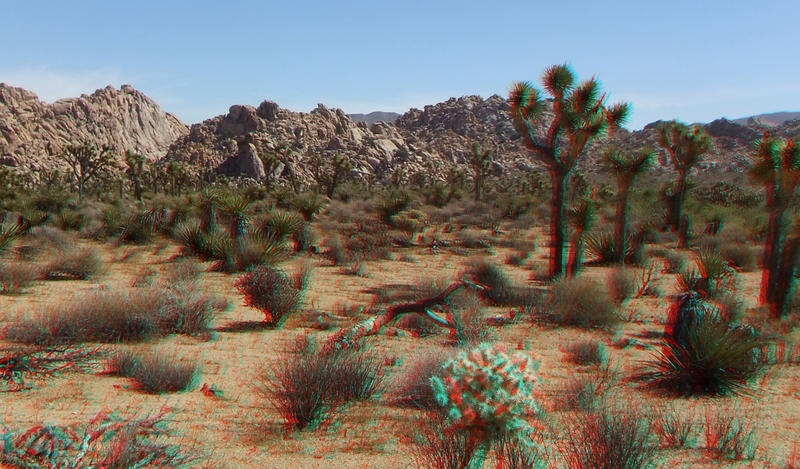 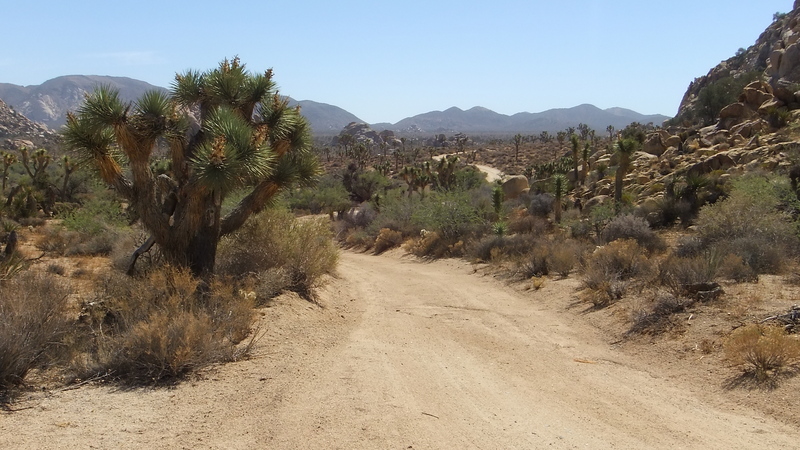 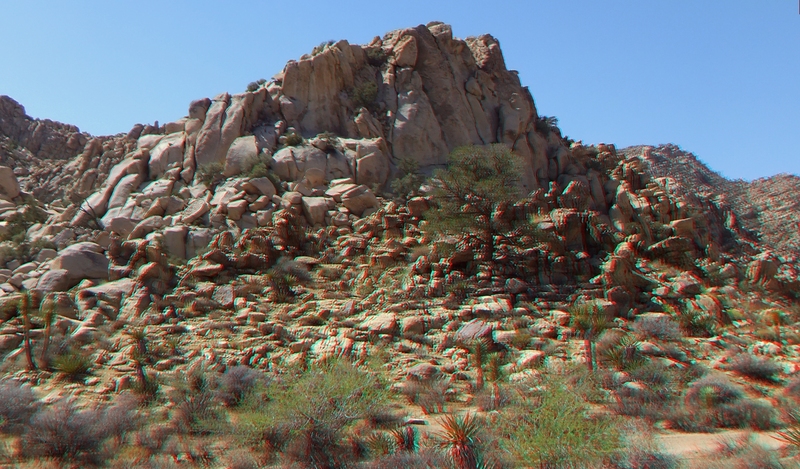 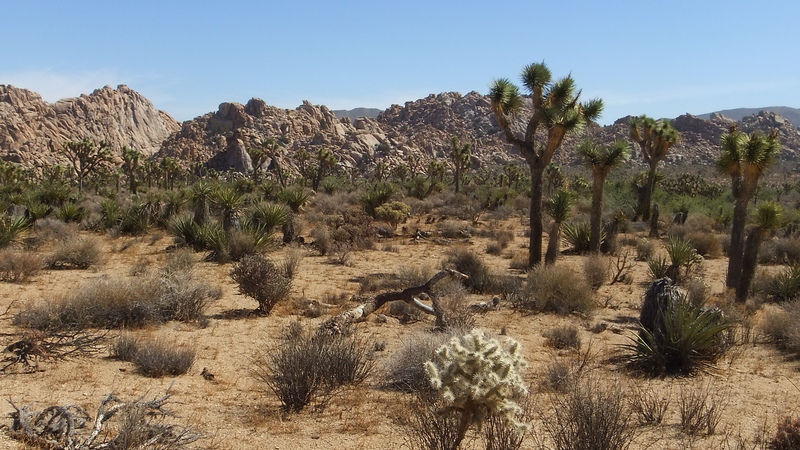 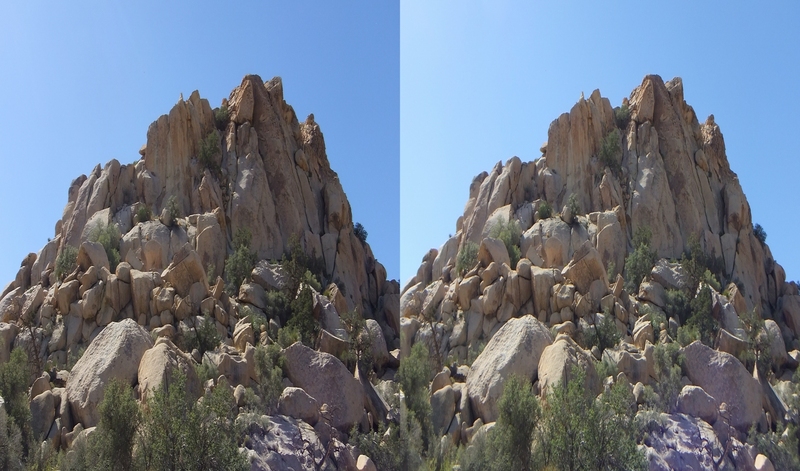 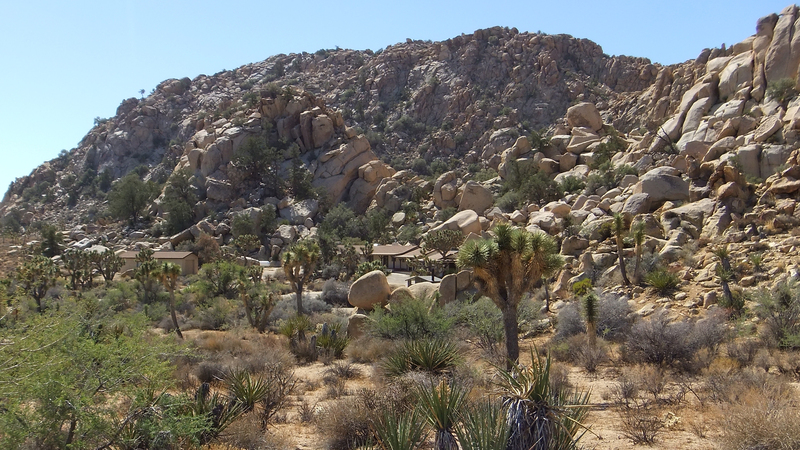 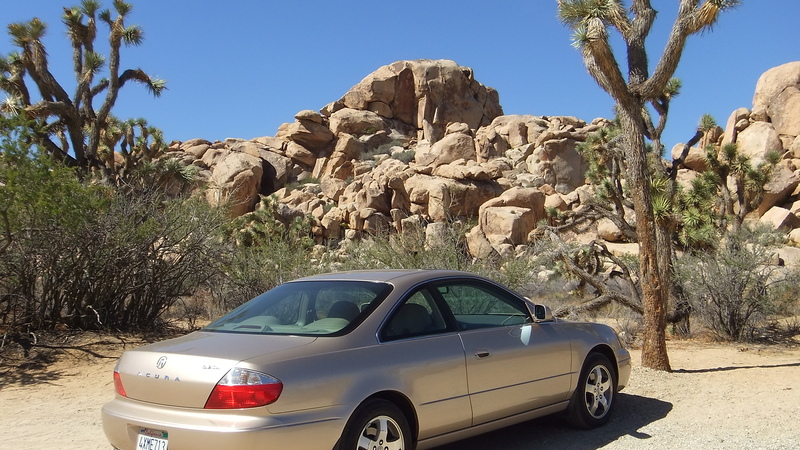 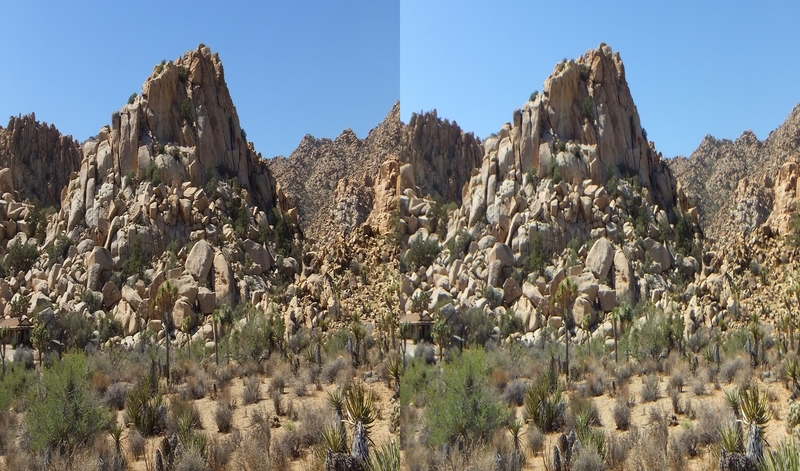 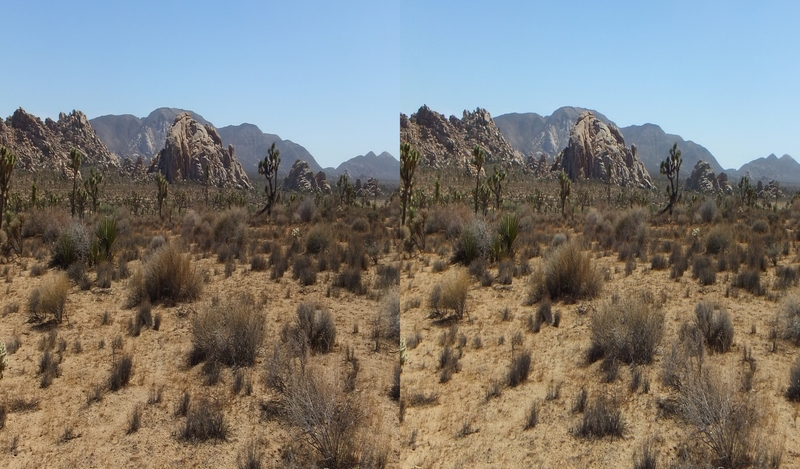 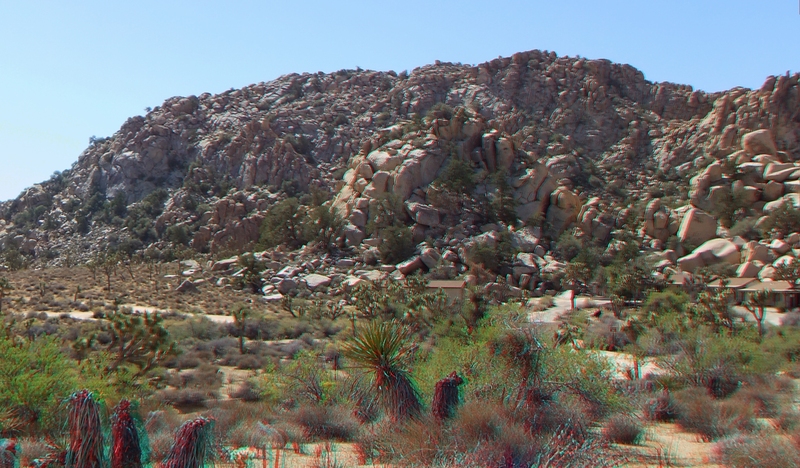 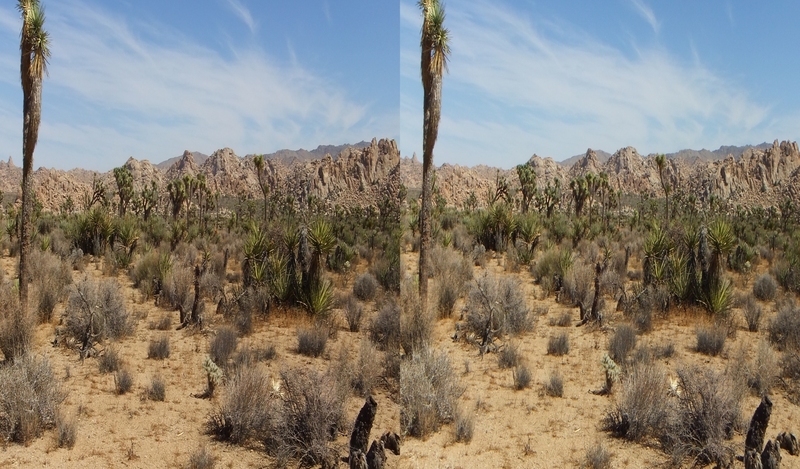 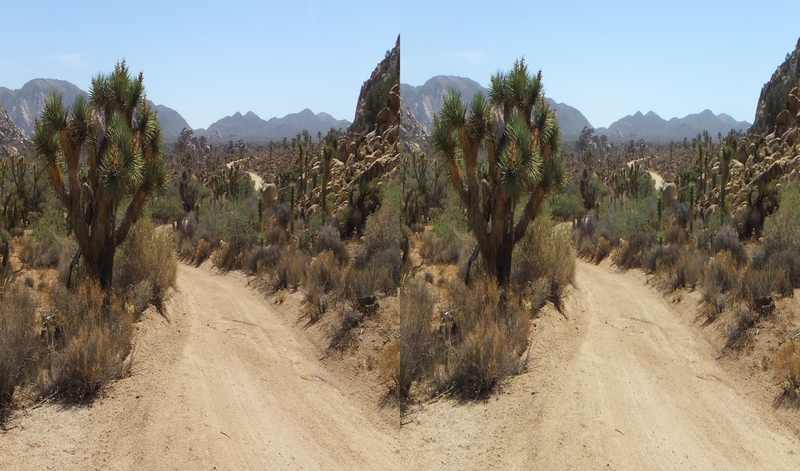 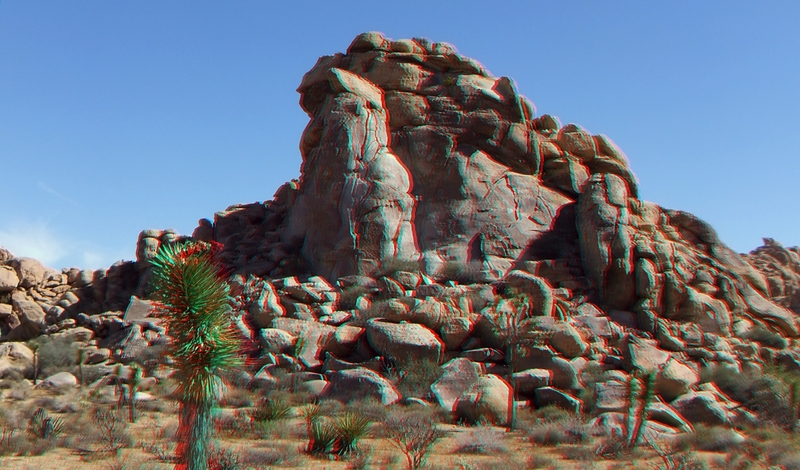 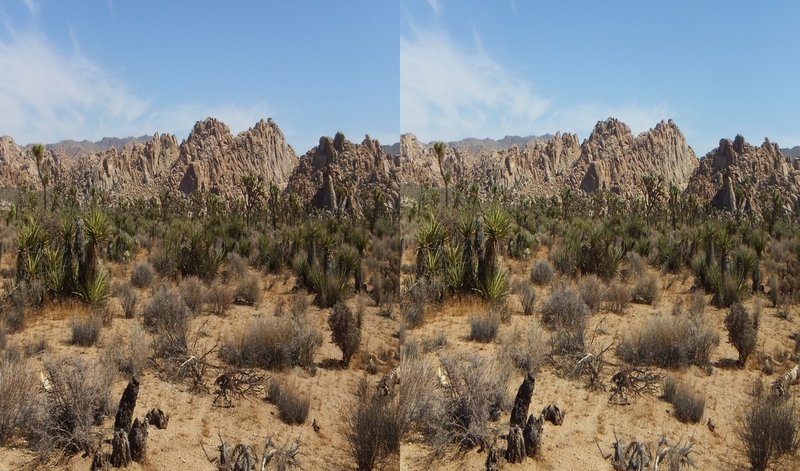 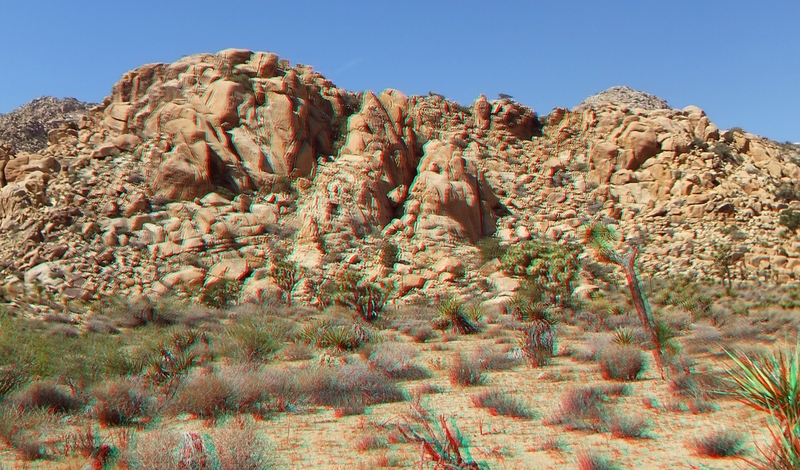 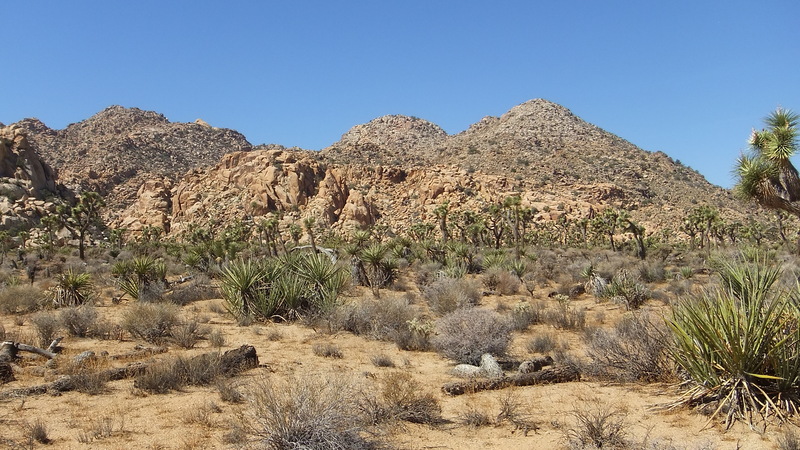 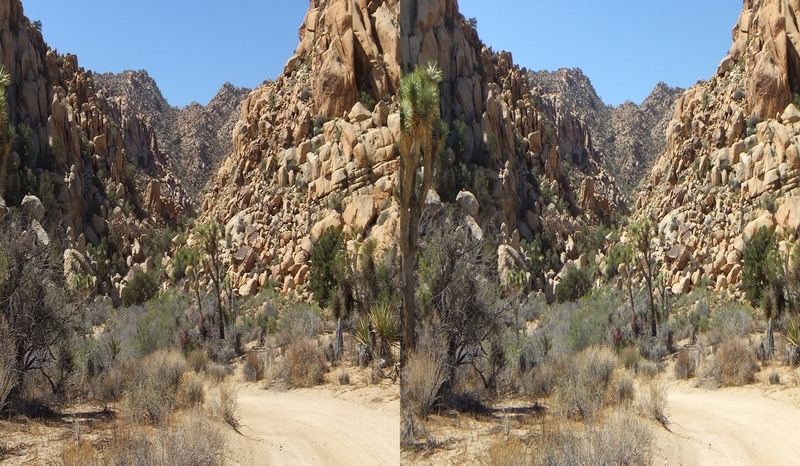 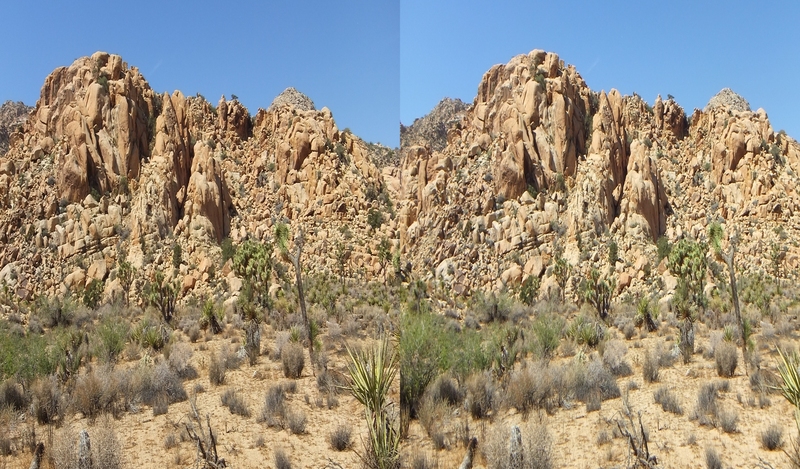 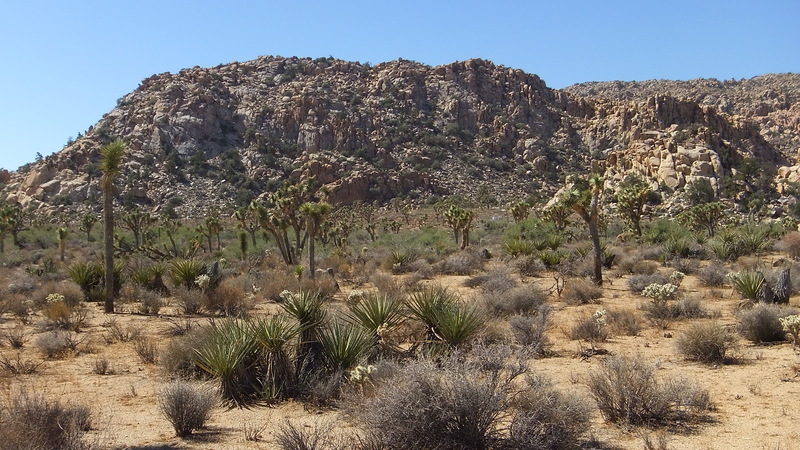 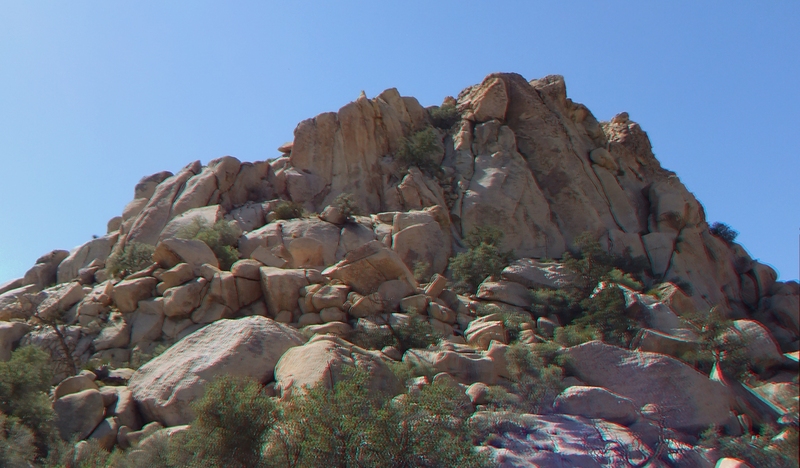 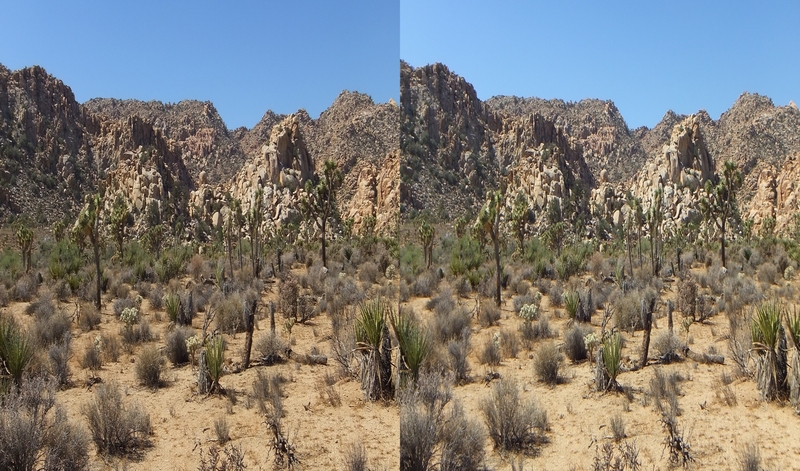 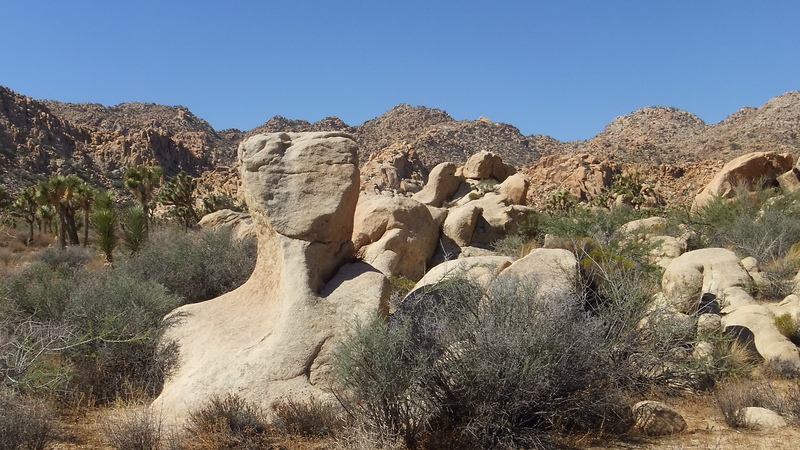 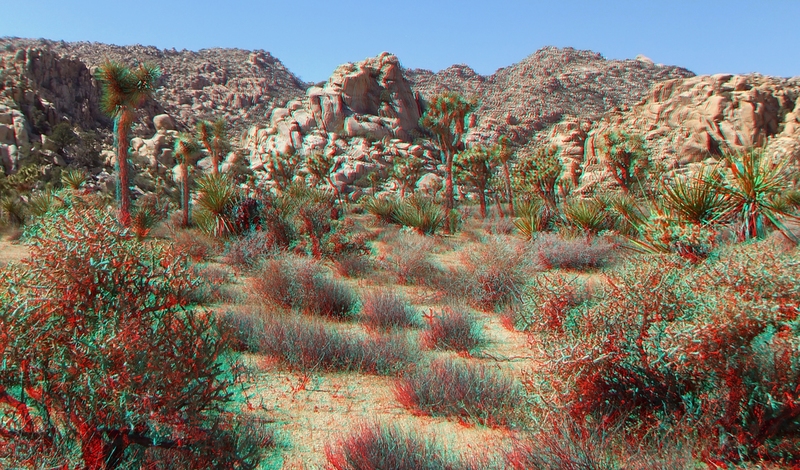 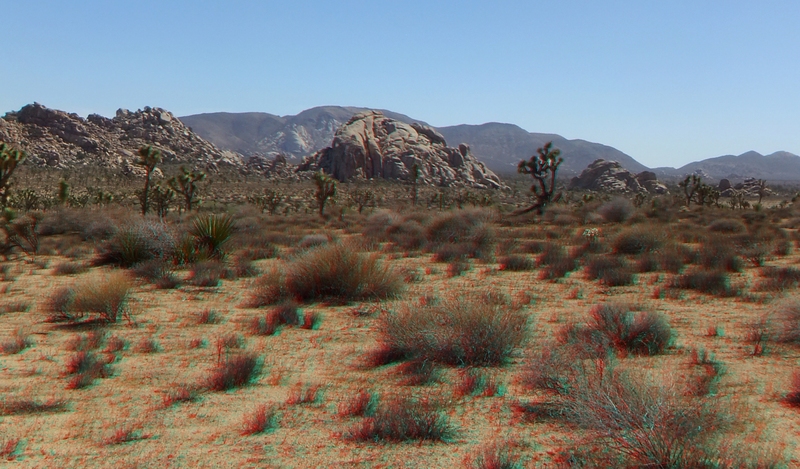 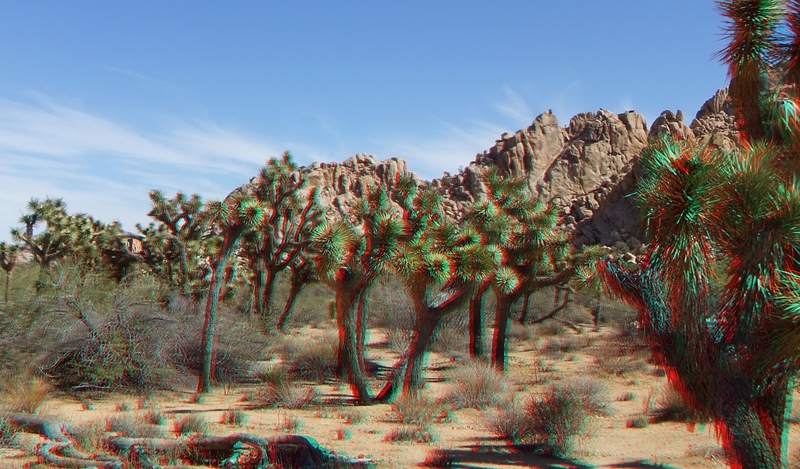 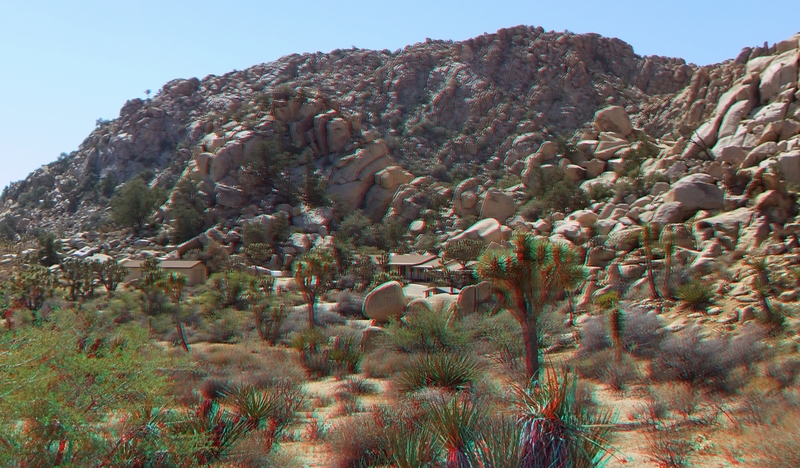 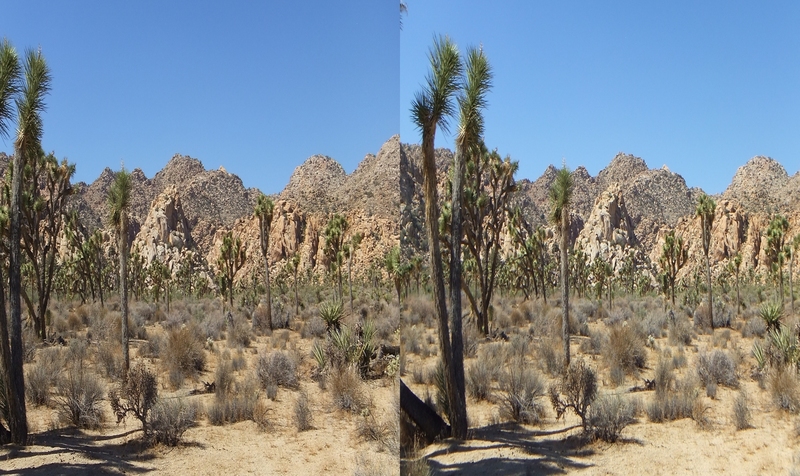 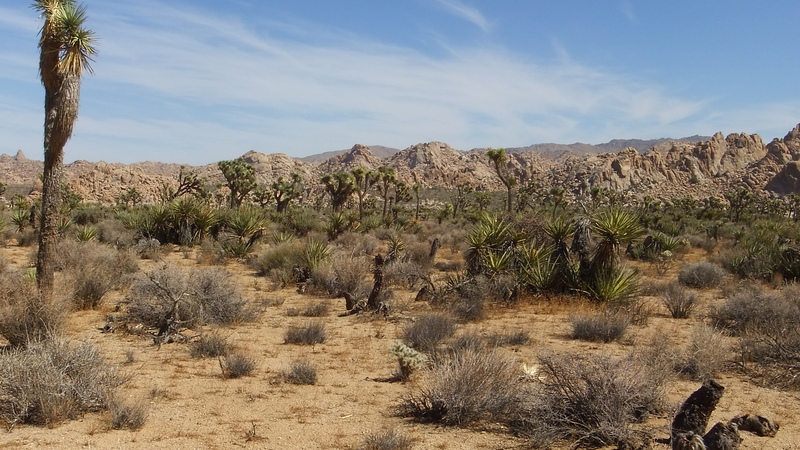 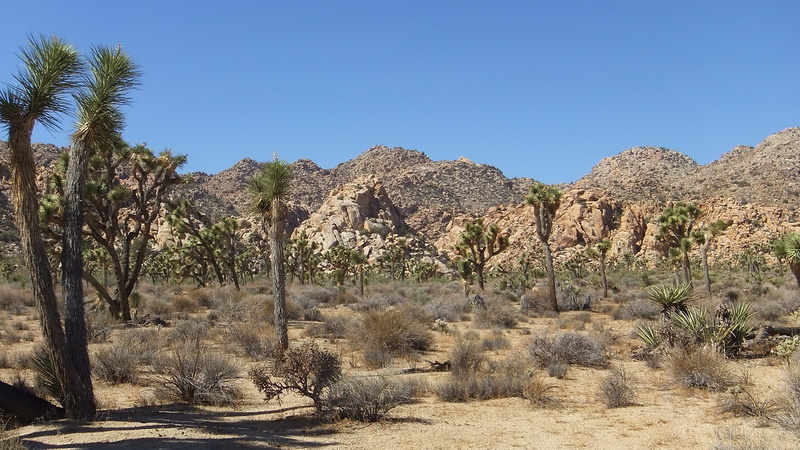 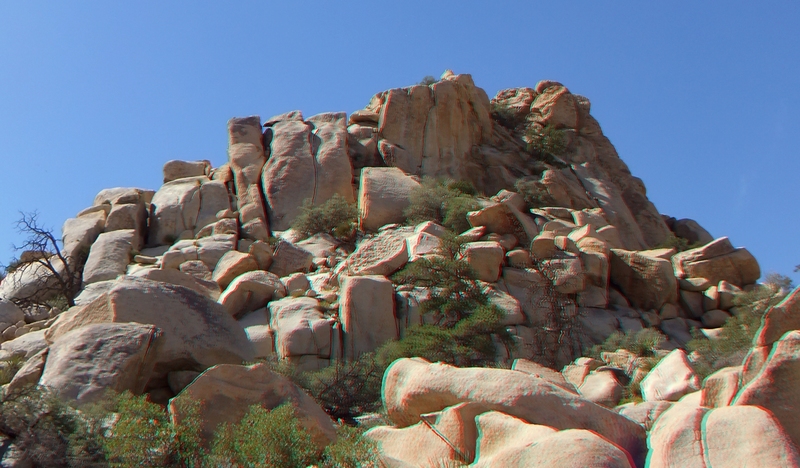 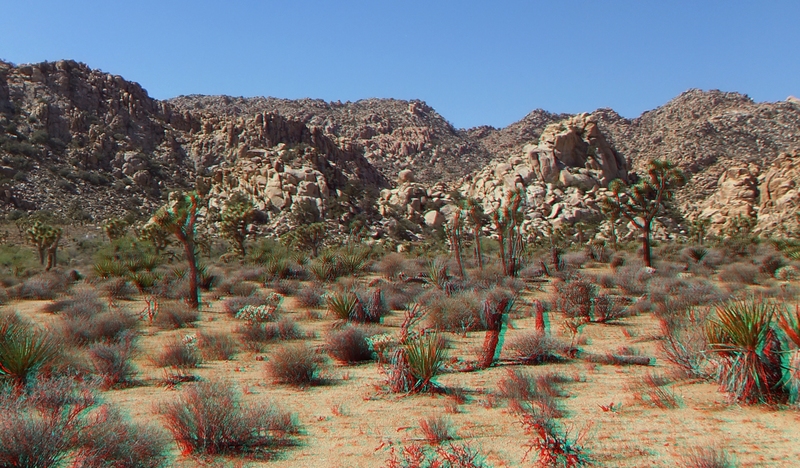 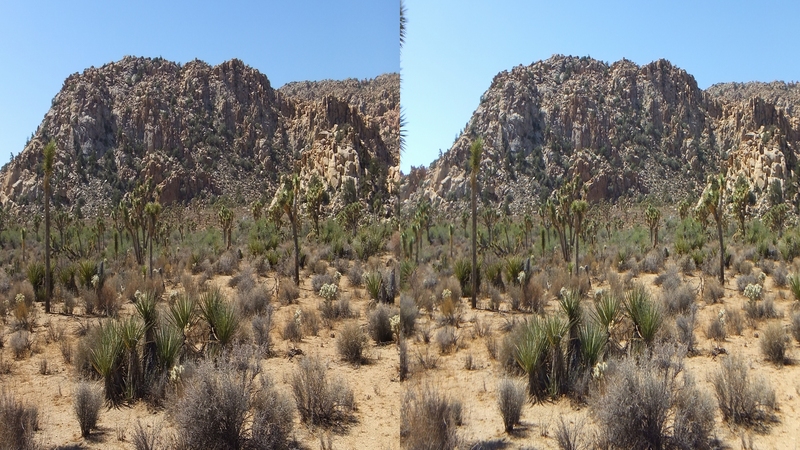 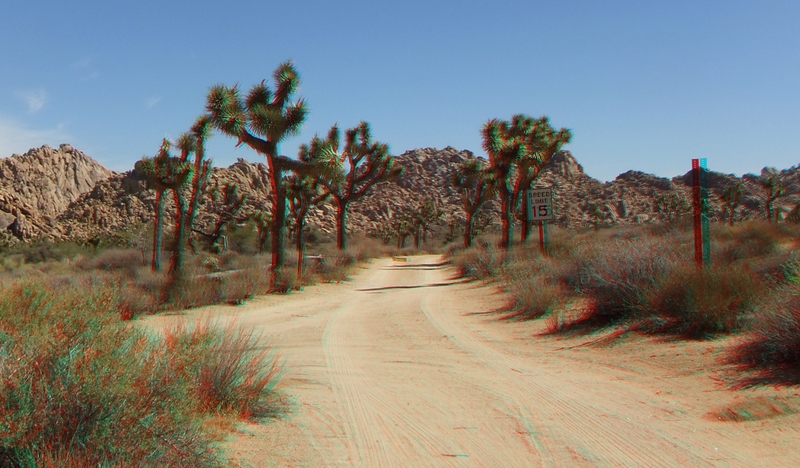 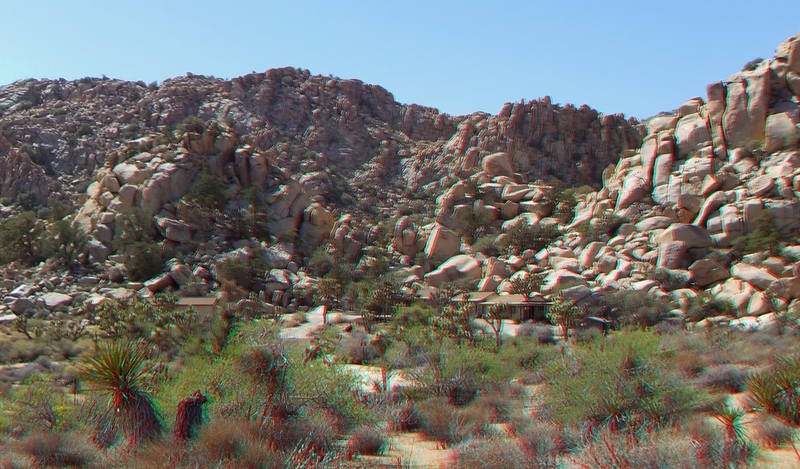 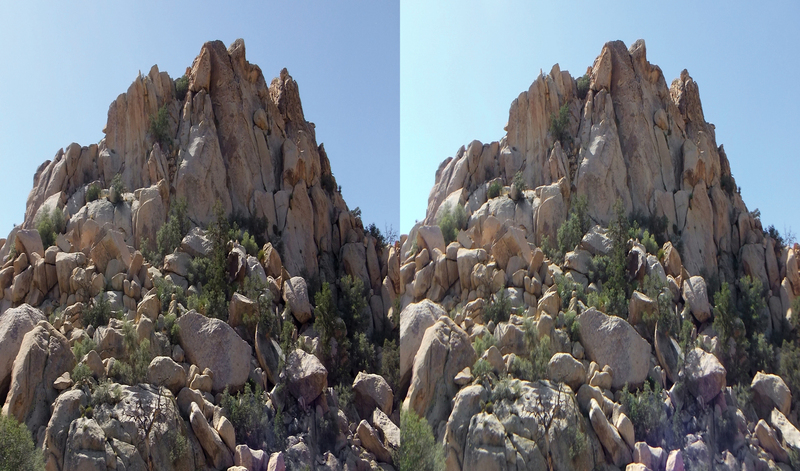 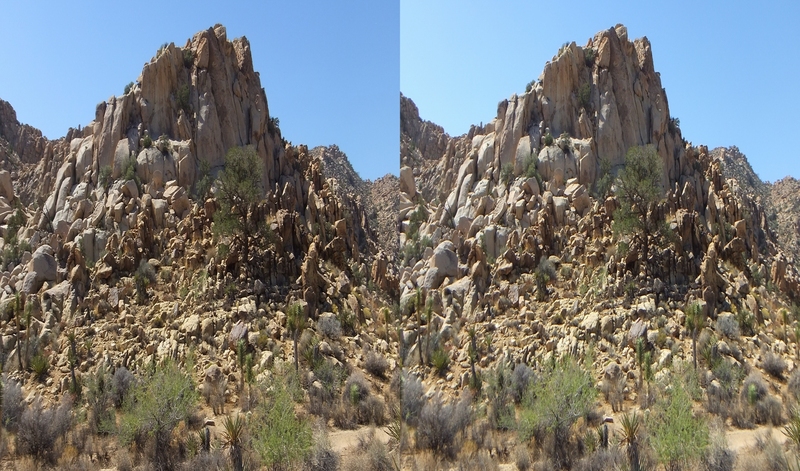 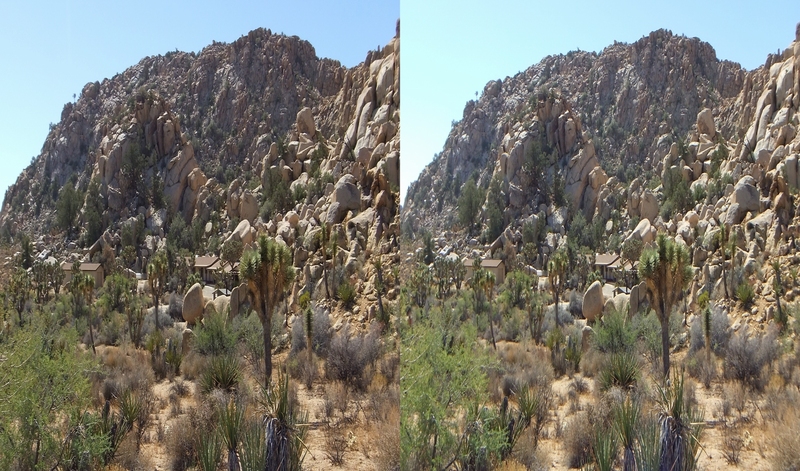 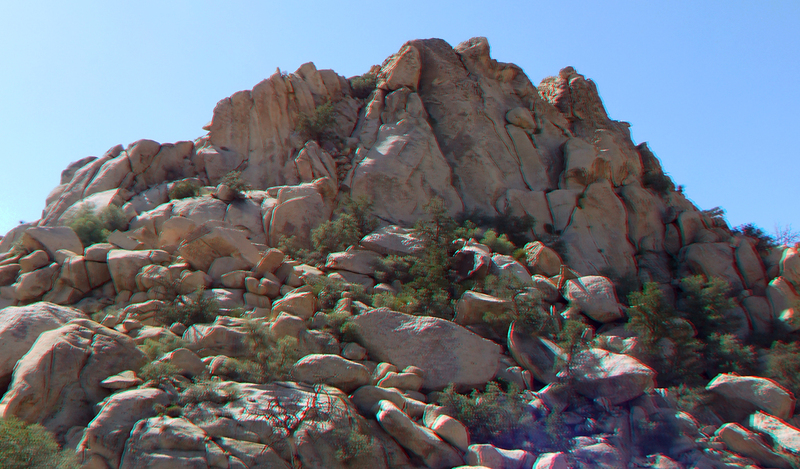 Thank you for visiting Joshua Tree 3D and the Lost Horse Ranger Station 3D galleries.